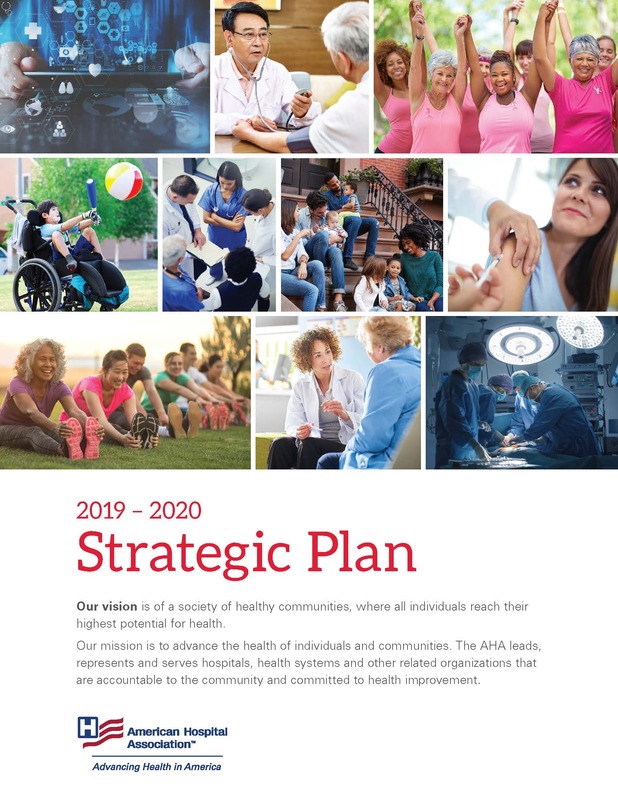 The American Hospital Association’s 2019 – 2020 Strategic Plan seeks to position the AHA to lead, represent and serve the field as its national advocate and provide guidance to our members and stakeholders who will tailor their paths to their own communities. The strategic plan is a living document that must adapt with the evolving landscape. A major driver of the new strategic plan is our Agenda for Innovation and Transformation. Through this new alignment, we will address strategic priority issues through the synthesized work of public policy, field engagement and innovation. Just as our members are changing, so too is the AHA. Our mission and commitments remain the same, as well as the vision of a society of healthy communities where all individuals reach their highest potential for health. These form a strong foundation for our members and the health care field. Our core strategy of advocacy and representation is an essential component of our work. Through advocacy and representation and the additional strategies of thought leadership, knowledge transfer and acting as an agent of change, we look forward to helping members seize the opportunities that lie ahead. 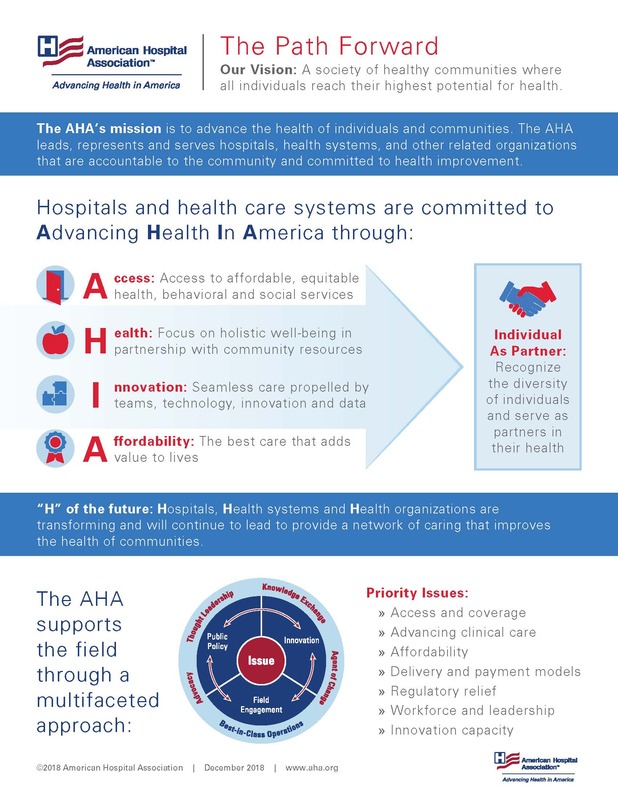 We encourage you to read the plan as well as the AHA Path Forward, which highlights the key elements of our strategic direction. 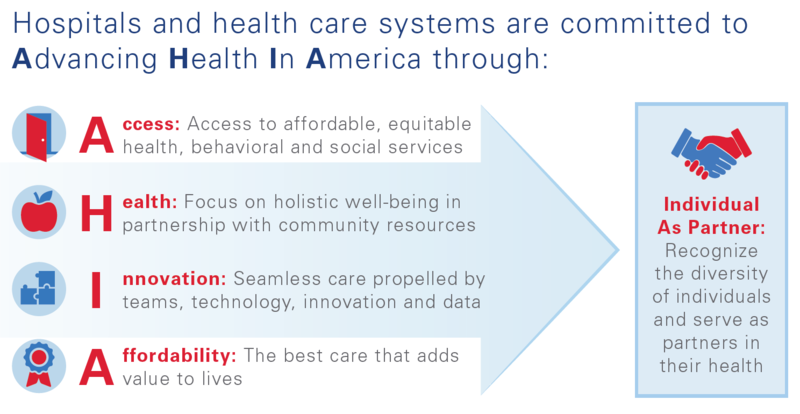 Additionally, the 2019 Environmental Scan details data and trends that will influence the health care field in the coming year and beyond. This publication can spur discussions with your organization’s leadership and staff about your strategy, innovation efforts and priorities within your community. 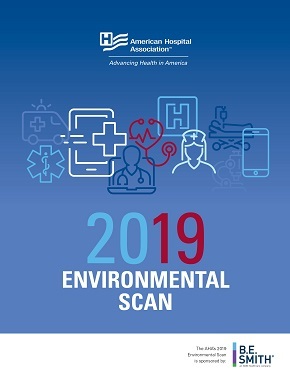 AHA members can access the 2019 Environmental Scan PowerPoint deck to help tell the hospital and health care story to your stakeholders and community. Together, these three documents can help you create dynamic strategies with your stakeholders and throughout your organization.